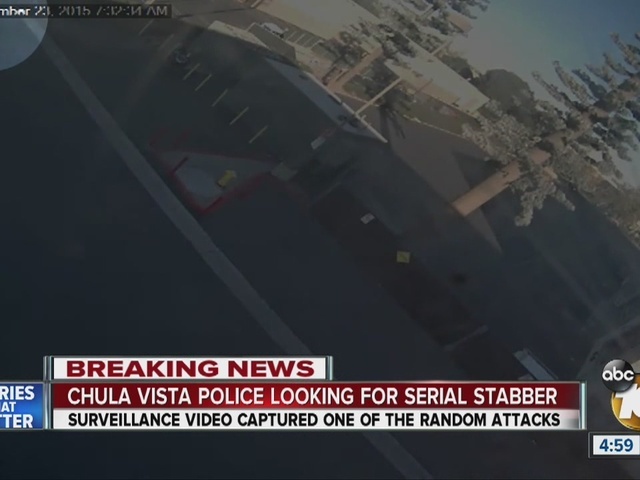 CHULA VISTA, Calif. -- A 45-year-old man suspected of stabbing three people in the back in Chula Vista during random and unprovoked attacks in the last two weeks was arrested Tuesday night. Gerardo Bejar was arrested during a traffic stop in the 500 block of Orange Avenue and was booked into jail on suspicion of three counts of assault with a deadly weapon, according to Chula Vista police and jail records. The latest in the series of non-fatal assaults allegedly carried out by Bejar occurred shortly after noon Tuesday in the 300 block of K Street, according to a police statement. The victim told investigators he was walking along the roadside when the assailant drove up in the opposite direction, stopped abruptly in the middle of the street and jumped out of his still-running Ford Mustang, Lt. Fritz Reber said. He grabbed the pedestrian from behind and knifed him once in the back before getting back into the car and speeding off. 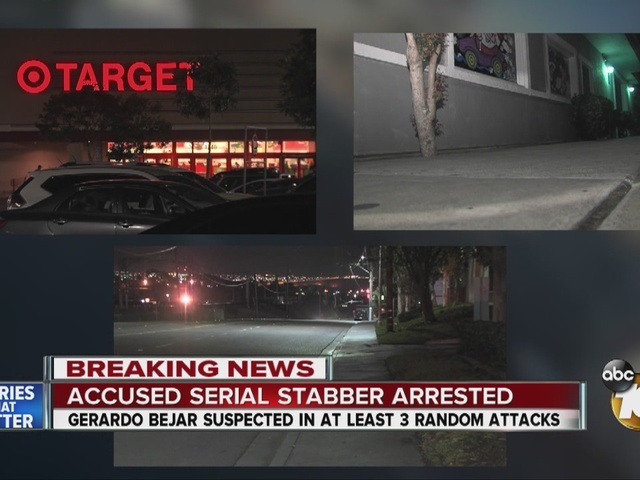 Police believe Bejar also stabbed a wheelchair-bound woman in the back in the 1600 block of Industrial Boulevard on the afternoon of Nov. 17 and jumped a man behind a Target store in the 1200 block of Broadway on the morning of Nov. 23 and stabbed him in the back as he began to turn away. Although the victims' descriptions of the suspect varied, all three said he was an unknown man in a gray or silver Ford Mustang, of which images were captured on surveillance video. Two of the three victims told police they saw a neck tattoo, according to the statement. Officers stopped Bejar's vehicle Tuesday night and he was arrested without incident, police said. Bejar was being held at San Diego Central Jail without bail pending arraignment, which was tentatively scheduled for Friday afternoon.